HIGH A Godzilla game that isn’t bad. LOW There are legacy issues. WTF That single player campaign. The Godzilla franchise deserves better. Over the years, all of its tie-in licensed titles have leaned on the giant beast’s name and offered very little in the way of quality fighting. The ‘best’ of the bunch were from the Gamecube period when four-player free-for-alls back then were entertaining, but they hardly qualified as good. 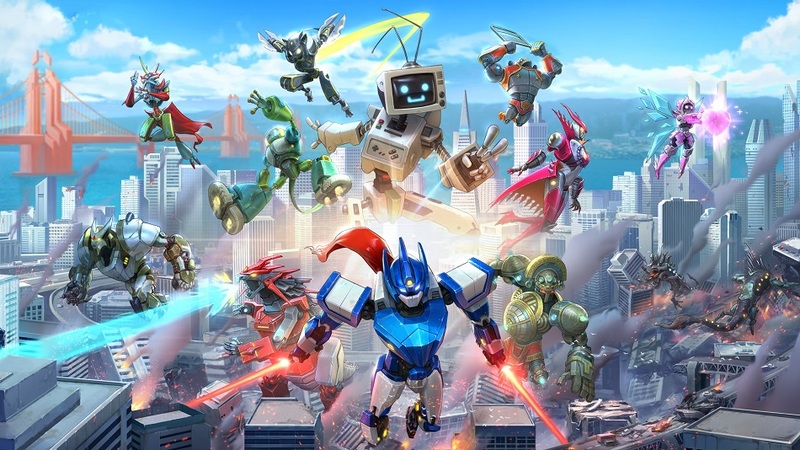 Override started off as a Kickstarter project with the intent of creating a quirky 3D party title where four players each controlled a different limb of a giant robot, and it hinted at QWOP-style hilarity via awkward mech combat. The scope seems to have changed since then with the game gaining a single player campaign, developing a more elaborate fighting system, and making the four-player party stuff a side project rather than the focus. 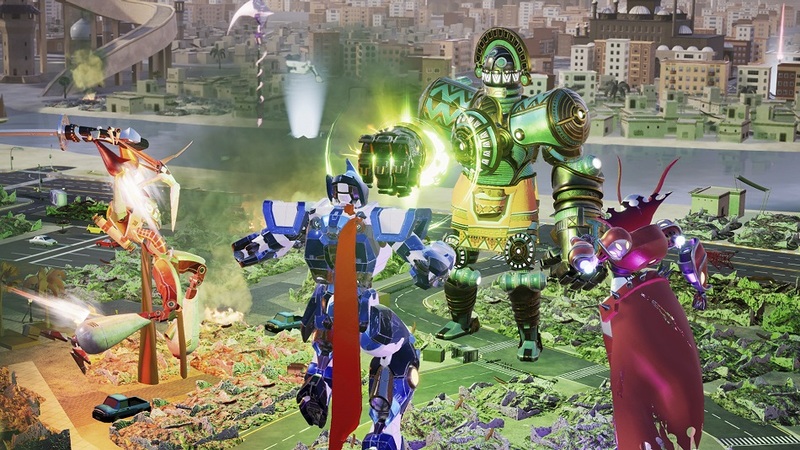 Mechanically, Override is a 3D brawler with up to four players onscreen at the same time. There are 12 selectable characters (and currently one more available as DLC) that vary from the floating, thin-limbed Contessa to the lumbering, lizard-like Metageckon. It can be played in teams or in free-for-all, and empty slots can be filled with AI characters. All of the characters have a stamina bar limiting the number of punches and kicks they can throw. Additionally, there are blocks, parries, unique special moves, desperation moves (when health is low) and a wealth of weapons that drop randomly. It’s safe to say that there are many opportunities to employ deeper tactics than just button-mashing. The levels vary by location. 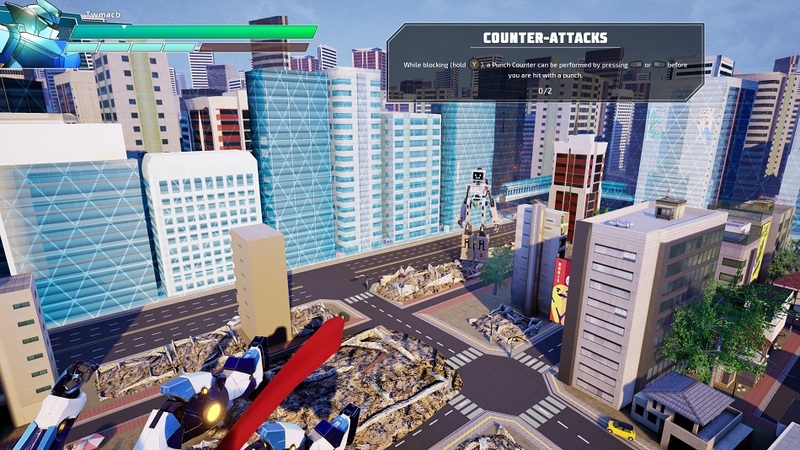 Brazil offers verticality – overlapping causeways allow for mechs to move around and look for weapon drops, while more straightforward areas like rectangular, flat Japan offer straightforward fisticuffs with amusing high-rises that crumble at the merest hint of contact — very reminiscent of old-school kaiju film sets. The single player campaign is brief, but has some good ideas. For example, the player can choose from a number of scenarios that vary in difficulty and rewards used to level their chosen mech up, and each time they undertake a mission it ticks off a number of days. When the timer hits 0, it triggers a boss fight and progresses the story. The singleplayer mode isn’t the main draw, though. No, Override‘s true appeal is getting into a ruckus with other human players in both local and online modes. I can’t speak to the player count worldwide, but I was able to find the occasional game without having to dig through my friends list. The online connection was also generally solid, with only the timing on parrying being slightly affected, but even then the window for correctly pulling the move off is generous. The problem I had with Override is that the modes and concept don’t add up to a cohesive game, and what they do deliver feels at odds with the party brawl scenario. The most dominant brawer at the moment is Nintendo’s Smash Bros., which favors a limited moveset to prioritize accessibility, but Override’s button combinations never felt natural to me. Using bumpers combined with holding down the X button for specials felt clumsy and desperation moves counter-intuitive. 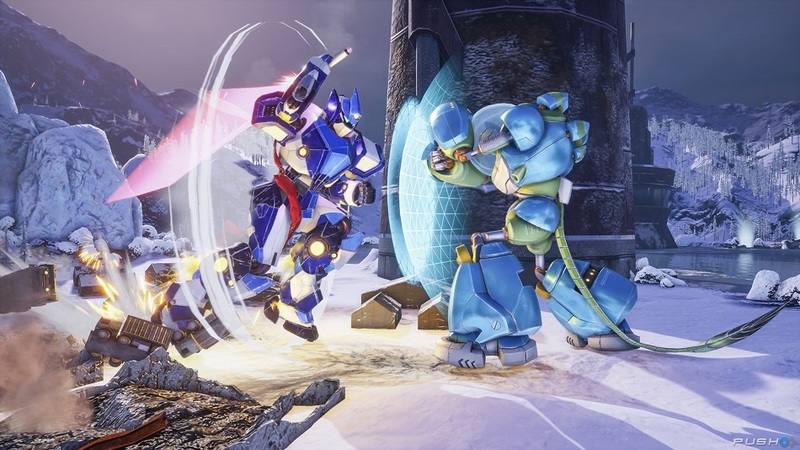 The fighting feels floaty, and even the heaviest characters don’t have any heft to them — given that this is a game about giant robots, it just doesn’t feel right. And while Override does have depth to its combat, the truth is that the majority of fights can be won by spamming attacks and ignoring more elaborate inputs. 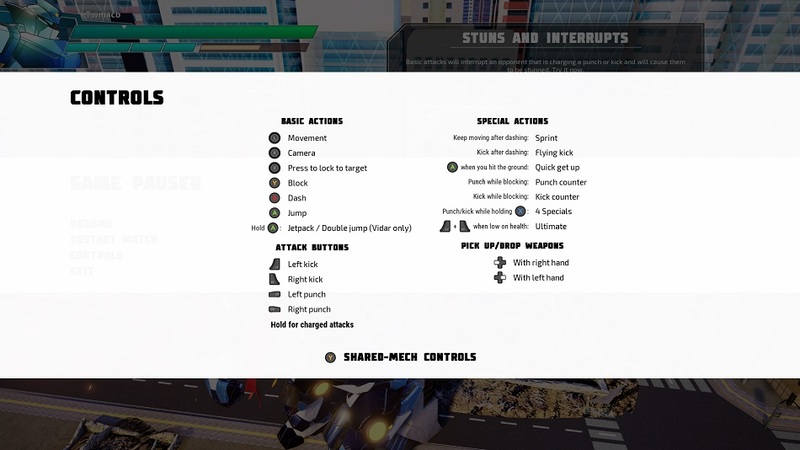 Finally, because of the refocus on mechs having a single pilot (understandable, since it allows more people to play) the remaining elements of of a Power Rangers-style multi-person control system are now reduced to a selectable option when beginning a game, and it doesn’t fleshed out. Rather than mechs being jerky weirdos requiring team coordination, one pilot handles movement while the others handle punches, kicks and blocks — it’s scaled up or down depending on the number of pilots per mech. I can see why this was the choice made, given that it allows for mechs to fight against each other no matter how many people are on a team, but these mechanics don’t feel conducive to enjoyable fights. In similar titles like Lovers in a Dangerous Spacetime or Space Team, entertainment comes from relaying information to teammates and telling them what to do or how they can help. At the same time, that person doing something isn’t necessarily detrimental to winning, and failure is often hilarious. In Override, it’s more about deciding who the leader is and having them tell the others when to attack in order to conserve stamina. In contrast to the other titles mentioned, people acting at the wrong time can ruin things for the other players, so it feels a bit like being muzzled. This setup as a whole is unsatisfying because there’s no effort required to coordinate locomotion, and being told when to press one button isn’t rewarding or enjoyable. Parents: According to the ESRB, this game is rated T and contains Fantasy Violence. I am a little baffled by the ‘Teen’ rating as there is nothing graphic about the game, no swearing, and the violence is at about the same level as Smash Bros. This is absolutely fine for a pre-teen to play. Deaf & Hard of Hearing Gamers: The game is fully playable without sound, there might be some moments where the camera cuts in close in a melee and it makes certain attacks confusing, but sound doesn’t ameliorate that. Text size cannot be adjusted. Remappable Controls: No, the controls are not remappable. AJ Small is a games industry veteran with over 12 years of experience. He started his gaming on the BBC Microcomputer and switched to being a devout SEGA fan from then on. He currently walks the earth in search of the tastiest/seediest drinking holes as part of his attempt to tell every single person on the planet that Speedball 2 and The Chaos Engine are the greatest games ever made. He can be found on twitter, where he welcomes screenshots of Dreamcast games and talk about Mindjack, just don’t mention that one time he was in Canada.